The mission of WRC’s self-advocacy movement is to empower all people to make life choices and to be part of their home communities. Self-advocacy groups strive to empower individuals to become active and influential members of their communities, as well as agents of change concerning their rights and wishes. At self-advocacy meetings, personal rights are discussed and individuals have an opportunity to share their experiences and concerns. Group members learn from each other and gain confidence to stand up for themselves. There are several active self-advocacy groups in the WRC area. These groups meet at various community locations including restaurants, malls and community rooms. Meetings offer a great opportunity for members to make new friends and maintain lasting friendships. The frequency and duration of meetings varies depending on the group’s wishes. Attendance at self-advocacy meetings is encouraged for all individuals served by WRC. Consumer Advisory Committee CAC is the leading Self-Advocacy group. CAC is a committee of the WRC. This group represents the concerns of all WRC consumers. The officers of CAC report directly to the WRC Board of Directors. If you have concerns and/or support for the decisions that the Board of Directors makes, then this is the group for you. CAC also oversees all Self-Advocacy groups. Creative Writing This group focuses on developing creative writing skills by actively writing our stories. Our stories are not limited and will reflect the vastness of our minds and imaginations. Everyone has a story to tell. In this group the members explore their creative talents and write stories. For those interested, we will pursue getting the articles/stories/books published. Culver City People First It is the mission of People First California, Inc. to help share, inform, and support local chapters so that all people with developmental disabilities are able to speak for themselves, know their rights and responsibilities, and become respected, valued members of our community. Executive CAC Executive CAC is the meeting where all the “business” of CAC takes place. Agendas for the CAC are created, past meetings are analyzed and future goals are set. Join us! Make the CAC work for you. Friendship Network The main focus of this group is respect. These members are concerned with how to treat everyone with more kindness, understanding and acceptance. Skills and techniques to avoid judgment and criticism are discussed. Members share their experiences with the intention of finding more positive solutions to daily situations. Go-Getters This group enjoys exploring their community. Often they choose to meet in different locations to experience different aspects and areas in their surroundings. Independent Group This group is for those individuals who are interested in more independence. These members use a “peer-mentor” approach and teach/learn the skills that are helpful when becoming or maintaining independence. Health and wellbeing topics and information are very important to this group. Leaders of Tomorrow In order to become leaders, you must lead by example. These individuals are particularly focused on the political decisions that affect their lives. Members learn how to speak to city and state officials and many of them are members of Boards that make decisions for their lives. They have active roles in their local legislation to affect positive change in existing laws. Let’s Talk Self-Advocacy with Linda Butler Are you an individual receiving services from WRC? Want to learn more about self-advocacy? Want to meet others who can support you in advocating for yourself? Want to get your point across and still get your needs met? Or, do you want to encourage, support or teach others the skill of advocating for themselves? If you answered “YES” to any of these questions, please join us. Bring your questions, ideas, bring a friend, we will listen and troubleshoot with you. Officers’ Training Managing a Self-Advocacy group can be very challenging. Members, who are group officers or those who are interested in becoming officers, attend this group for support and training in the skills necessary to successfully run a Self-Advocacy group. People In Action (P.I.A.) We explore current events that concern our lives. We also participate in, or create, fundraising events. We work to make our lives and the lives of others better. Shakers In this group we are working together as a team by setting goals and motivating each other to achieve them. We work on our personal mission statements and create a life plan to facilitate our next steps. The Lanterman Act is also reviewed in this group. Strive for Awareness (S.F.A.) In group we review the latest news and legislative issues that affect people with disabilities. We write to our local legislators and we attend rallies and seminars to keep up with the latest information. We also help others get registered to vote. Travel Club This group is as its name suggests, a group about travel. It includes going to places that we have chosen and doing so on a budget. We make plans to travel locally and long distances. For example, we have been to places like Las Vegas, San Francisco, San Diego, Sacramento, Theme Parks, Museums, Fairs, Concerts, just to name a few. We also learn how to plan trips ahead of time and learn creative ways to save money for trips. Westside Jam Sub-Committee The Westside Jam is an annual celebration of Self-Advocacy. This group assists in the planning of the next Westside Jam. Bring your ideas and thinking caps. We would love to hear from you. Winners This group focuses on volunteering and giving back to the community. Throughout the month, each member volunteers at a place of their choosing. They also review the Lanterman Act and bring current information from organizations that are looking for volunteers. Peer Support Group (27+ Years) This is an exciting group for clients of WRC who are 27+ years of age, are interested in peer support and in assisting and empowering not only themselves, but also their peers. Please contact your service coordinator to discuss referral and current availability. Peer Support Group (Transition Age Youth: 17-27 Years) This is a vibrant group for clients of WRC who are between the ages of 17 to 27 years and who are interested in empowering themselves and their peers – in a supportive, welcoming environment. Please contact your child or young adult’s service coordinator to discuss referral and current availability. The Peer Mentor Lifestyle Coach Agency (PMLCA) is a non-profit organization that specializes in training people with development disabilities to serve as Peer Mentors. The unique feature of PMLCA is that Peer Mentors are responsible for training and assisting others with development disabilities. Peer mentors are trained to provide independent living support, mobility training, community inclusion, socialization and health lifestyle coaching. Peer mentors are responsible for training and assisting others to develop the sills necessary to live as independently as possible. Peer Mentors also provide skills training in: budgeting, shopping, meal planning and preparation, household maintenance, time management, community access, mobility, self-advocacy, developing effective communication skills and locating social and recreational opportunities. The Healthy Lifestyle Change program is a service for Peer Mentor Lifestyle Coach Agency. The healthy Lifestyle Change program is another peer mentoring venture which was established to identify and support adults with disabilities who are at risk for or who have a diagnosis of Type II diabetes as well as supporting people who wish to develop a more healthful lifestyle. The groups meet at the Westside Regional Center located in Culver City. Peer Mentors, fitness and nutrition facilitators support people to incorporate exercise and good nutrition education into their daily routines. Click here for the monthly calendar. Who comes to this fun group? Anyone who wants to be social and have fun! May I bring a friend? Of course! Bring a friend and you will also make friends at the group. Is there food? YES! We have tasty refreshments. How much does it cost to go? It’s FREE! That’s right, FREE! What if I’m looking for a roommate? Attend a “Networking” meeting and one of the peer mentors can assist you. Families of the individuals that we serve play a key role in their child’s life. In addition to nurturing, caring and providing for a child’s well-being, your responsibilities include understanding special needs and the services that are available to help. Family members often find that sharing their feelings and experiences in a supportive setting can be meaningful and helpful. Participating in support groups is one way families obtain information, education, training and emotional support. Westside works closely with our Family Resource and Empowerment Center (WFREC) to develop and offer a number of support groups for our community. Our WFREC also maintains resources of groups in the community, information regarding a wide variety of support groups in our community, and national organizations. Click HERE to visit the Westside Family Resource and Empowerment Center website. If you need additional information, contact your WRC Service Coordinator, or call WFREC at 310-258-4063. African American/Black Families Support Group Let’s make it happen, TOGETHER! Be part of the conversation: our safety, our resources, our concerns, our needed services and more. Alianza Familias Especiales (A.F.E.) 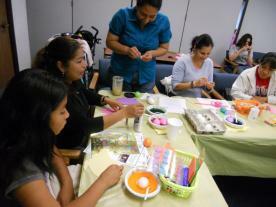 This group offers support for Spanish speaking parents of infants, toddlers, and children who have special needs. Los Angeles Asperger Syndrome Parents’ Support Group An off-site support group for parents of children diagnosed with Asperger’s Syndrome. Parents of Ethiopian Children with Special Needs This group offers support for Ethiopian parents with children who have special needs. Siempre Amigas This group offers support for Spanish speaking parents of infants, toddlers, and children with special needs. 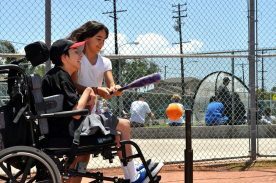 West L.A. CHADD Provides support for families of children, youth, or adults with ADD/ADHD. Westside TIGERs Workshops on Special Education advocacy for parents of infants, toddlers, and children with special needs. 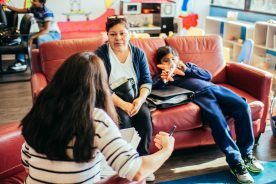 Therapeutic Support Group for Parents of Children and Adults with Developmental Disabilities This therapeutic group focuses on improving our ability to cope with stress and feel less overwhelmed in our journey as parents, while improving our collective resilience together. Culver City, CA 90230 Please contact your service coordinator. The following workshops are for WRC families ONLY. For additional workshops, view our workshop calendar. Informed Education Partners (IEP) Provides information and strategies to assist parents to become stronger advocates for the Individualized Education Plan meeting with the school district. Orientation to the IHSS Program Introduction to IHSS for individuals who are initially applying or need to learn basic information about the IHSS program. Please reserve your space prior to the IHSS Workshop. 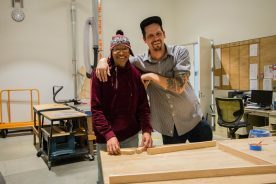 No “drop-ins” will be allowed in during the workshop. Training starts promptly. Doors close after 20 minutes. Advanced IHSS Trainings For individuals who need more in-depth information about the IHSS program and who may be appealing, requesting more hours, or re-evaluations. Bring your IHSS Notice of Action (NOA) and any other documentation you want to share pertaining to IHSS. Sibshops Support program for siblings who have brothers or sisters with any special needs who are WRC clients.